Gustav Klimt's decorations for Palais Dumba -Vienna University- were his most controversial and radical paintings. These cosmic dream pictures were attacked for their eroticism and atheism in his lifetime – today they might secure his reputation as a great modernist. But together with other paintings, including Schubert at the Piano (above), they are said to have been burned by the SS in 1945. In 1898, the Greek industrialist Nikolaus Dumba commissioned Hans Makart (1840-84) - a then fashionable painter - Franz Matsch and Gustav Klimt to decorate three rooms in his luxury apartment with paintings and also furniture. This involved quite different considerations from anything Klimt had tackled before. He was to produce two paintings to go in the panelling above the doors for a private client, on a domestic scale. Klimt was given the music room. A watercolour survives, showing how he envisaged the paintings in relation to the decoration of the rest of the room. While one of the canvases, Music II, is an allegorical work harking back to earlier paintings, the other, Schubert at the Piano, is highly innovative. 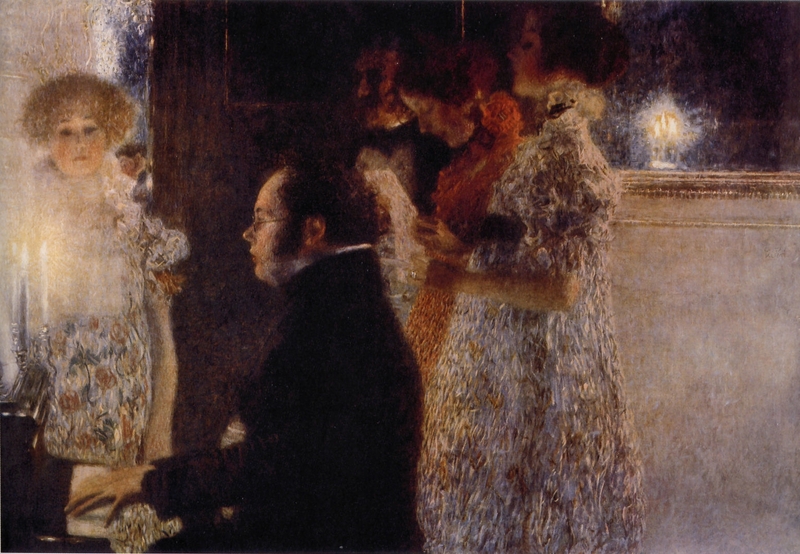 Presumably Dumba requested that Schubert be the subject of the picture; he was certainly popular at the time and he also happened to be Klimt's own favourite composer. What is particularly striking about Klimt's portrayal of the musician is the way in which Klimt has completely abandoned the idea of an accurate historical representation, depicting the onlookers in contemporary dress. The subtle lighting given off by the candle tends to dissolve the elements in the picture. 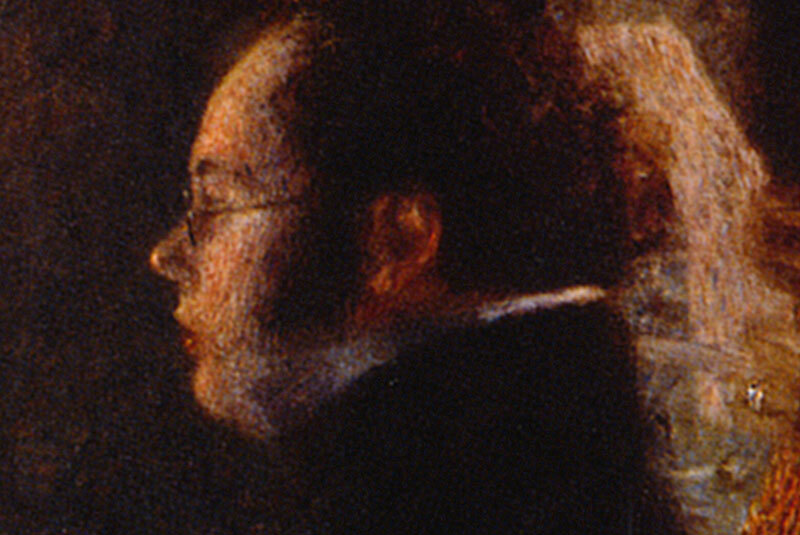 It is not possible to determine the space in which the figures are shown and only Schubert's profile stands out in sharp focus. The woman on the left is Marie Zimmermann, one of Klimt's mistresses, who gave birth to two sons by the artist. Il dipinto arriva a noi da una riproduzione. Insieme ad altri dipinti, "Schubert al pianoforte", si dice che e stato bruciato nella seconda guerra mondiale da un incendio appiccato al Castello di Immendorf dalle forze tedesche in ritirata, nel 1945. Le decorazioni di Klimt per la sala della musica presso il Palais Dumba a Vienna -l'Università di Vienna- erano i suoi dipinti più controversi e radicali. Queste tele cosmiche da sogno sono state attaccate all'epoca per il loro erotismo e l'ateismo, mentre oggi, rafforzano la sua reputazione di grande modernista. Nel 1898, l'industriale greco Nikolaus Dumba commissionò Hans Makart (1840-1884) - un pittore allora di moda, Franz Matsch e Gustav Klimt a decorare tre stanze del appartamento di lusso con dipinti e anche mobili. A Klimt vennè affidata la sala della musica. Gli acquerelli sopravvisuti mostrano come egli prevedeva i dipinti in relazione con le decorazioni del resto della stanza. Mentre una delle tele, Music II, è un'opera allegorica, rifacendosi ai dipinti precedenti, l'altra, Schubert al pianoforte, è altamente innovativo. 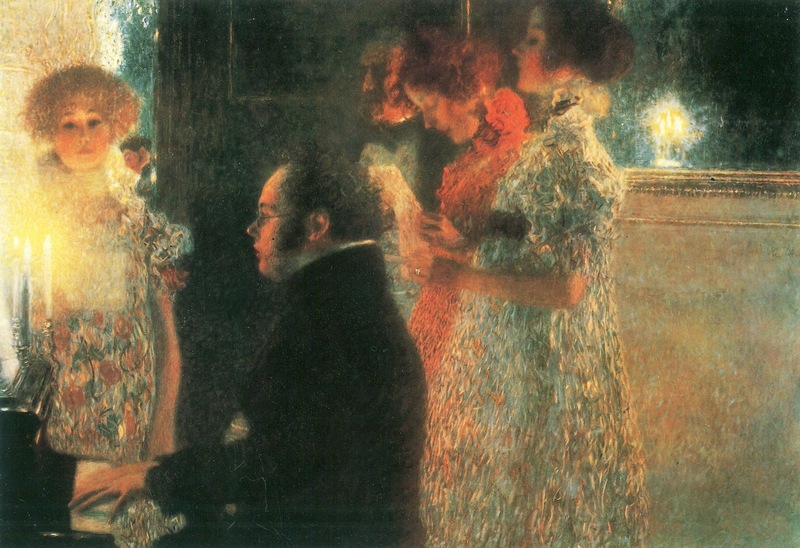 Presumibilmente Dumba ha chiesto che Schubert sia il soggetto del quadro; egli era certamente popolare al tempo ed era anche il suo compositore preferito di Klimt. Ciò che particolarmente colpisce è il ritratto di Klimt del musicista è la circostanza che Klimt abbandonò completamente l'idea di una rappresentazione storica accurata, raffiguranti gli spettatori in abiti contemporanei. L'illuminazione sottile sprigionata dalla candela tende a dissolvere gli elementi nell'immagine. La donna a sinistra è Marie Zimmermann, una delle amanti di Klimt, che ha dato alla luce due figli dall'artista.